I’ve written extensively about us using PTV’s Vistro software to do traffic forecasting and analyses (here, here, here, and here). It’s cut our labor in half doing traffic studies because the modeling software is straightforward to set up and it automatically produces all of the figures and tables we need for our reports. 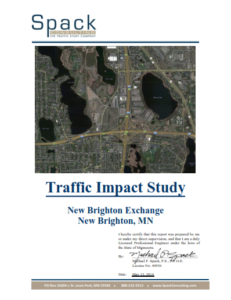 Last year we did a traffic study for the City of New Brighton Exchange Area. The area is partially built, but the city is planning for about 400,000 more square feet of office, 15,000 square feet of retail, and about 200 apartment units. The city laid out their best guess at the development plan. We studied half a dozen intersections (existing + proposed) along the main corridor running through the study area to determine if any of the intersections will need further improvement. We determined one of the intersections would need to be expanded and another intersection will need a traffic signal. We also iterated the traffic forecasts to determine how much more of the background traffic and development traffic could be accommodated without making the improvements. The city came back to us this spring to revise the analyses. They have a developer who wants to build out most of the land that’s zoned for the office buildings, but they want to eliminate one of the access roads to the main corridor. The eliminated intersection happens to be the one at the center of the office development where we were recommending the traffic signal. Our tasks this spring were to update the forecasts with the slightly different office square footage, determine where the traffic signal should go with the new access plan, determine if the system will work with one less access, and iterate to determine when improvements will be needed. This effort took Max about two days in the office working in Vistro and then another day to revise last year’s report to cover this new development plan. We delivered the study and the city engineer is happy with it, but he did have a question – we assumed a 1% annual background growth rate in both of our studies. That could be a little conservative. What if we only have 0.5% annual background growth rate? Max changed the growth rate in Vistro and ran all of the analyses again. About three hours later, he sent the city engineer a quick update with results and how this would change our recommendations. We didn’t revise our report to include this iteration (you can iterate all of your assumptions to infinity), but we did talk through what this would mean for the project. I’m still amazed at how fast we can iterate scenarios using Vistro. Doing these types of analyses would have taken a week (maybe even weeks) in the past, so we rarely did them. Now they take us a couple of hours. I believe our engineering has improved because we are iterating more to test our assumptions. hi: i want to know if Vistro is able to work alone or if this software must be acompanished with another one. Vistro can work by itself to do the forecasting and capacity analyses. You have to add a license for Vissim if you want to export to do micro-simulations. You can contact PTV America for more details. Copyright © 2018 Mike on Traffic, LLC. All rights reserved. Sign up today and you will also receive the first in our series of FREE Engineering Guides: Access Management Primer. Sign up today to receive your first free research brief!